When it comes to the full Travaasa Austin experience, Jenn’s post here can’t be topped. (Nor can the Travaasa experience, for that matter.) We only spent about six hours there, yet we left feeling like we’d had a full weekend away from it all. Riding a mechanical bull is way harder and three times as fun as you’d expect. You do NOT want to thumb-wrestle Loni. After donning an incredibly luxurious spa robe, I waited briefly in a cozy and elegant sitting area just outside the dressing room. Loni escorted me to the private room, where she explained what would happen during the massage, asked about my trouble areas and prior injuries, and we discussed the massage pressure. Loni is a slender, diminutive woman, so when I requested a deep tissue massage I honestly didn’t expect to get the body work I desperately needed. Never judge a book by its cover: Loni has finger strength that belies her size! When I laid face-down on the table I was pleasantly surprised to find it being warmed with a heated blanket! That Saturday was a cold, rainy day and that warmth was SO welcome! It’s just one example of the attention to detail that makes Travaasa Austin unique. I’d never experienced a massage listening to anything other than new age-y music, so I wasn’t sure what I would think of listening to Janis Joplin. Surprisingly, it actually made me more relaxed: instead of lying there feeling like I should RELAX NOW, I was just enjoying the playlist and looking forward to what might come next. It really helped me get out of my head. Loni spent a lot of time working on my shoulders, since that’s where I store a lot of my tension. It never once hurt, but by the time she moved on the boulder-sized lumps had been reduced to small skipping stones. (Hey, no one can work miracles in a single session.) Frankly the rest of the session was a blur of awesomeness, and afterwards she gave me some very helpful stretching exercises for my shoulders and hamstrings. From there Jenn and I moved on to the dining area for lunch. I honestly could have spent the entire day in that room – it had big leather couches in front of the large fireplace, lots of tables for dining, and a self-serve tea/coffee bar. After our delicious meal and dessert, we again parted ways to enjoy some of Travaasa’s activities. 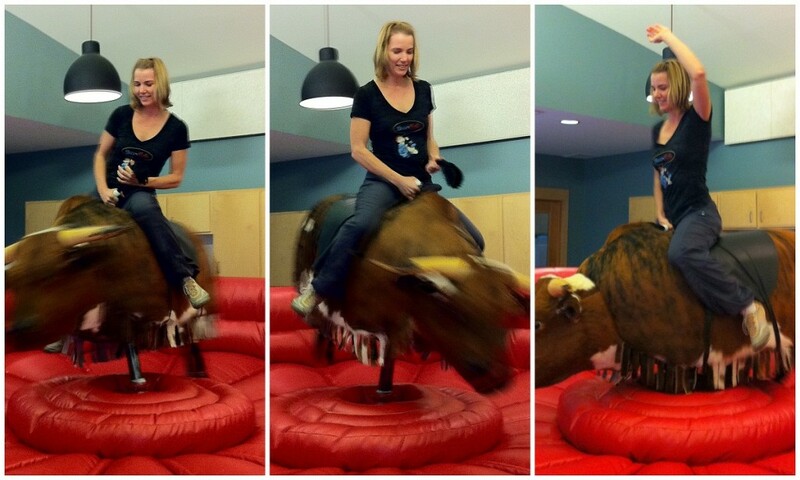 I headed over to the mechanical bull riding session with a mixture of excitement and trepidation. Would I be able to stay on at all? Would I be revisiting my lunch?? The mechanical bull has a dial that goes all the way up to level 55, and our instructor started us all on level 10. When it was my turn I climbed awkwardly into the ring, jumped on Brutus’ back, grabbed the rope with both hands and gripped his flanks with both legs as tightly as I could. I told her I was ready (which was a lie), and she turned the bull on. It started off easy, and I was feeling like a big baby for being afraid of it at all. The sensation was odd but not unpleasant: the bull kind of undulates, with the occasional abrupt change in direction. The funny thing was that it was easy until it wasn’t; then suddenly you knew you were going to fly off and there was nothing you could do to stop it. My first two tries I kept both hands on the rope, but I did try it one-handed just for style. I don’t want to brag (yes I do), but I made it all the way up to 30 on that dial. If they’d let me I’d have kept trying for level 55, but thankfully for all of us it was time for Two-Step lessons! Some of you know this but most probably don’t: I’m not a native Texan (but as the saying goes, I got here as fast as I could). I didn’t learn to two-step until I was a freshman at Texas Tech University: my girlfriends took me to a honky-tonk bar and threw me at an old cowboy. (He was infinitely patient and polite, but I’m pretty sure he was a lot more aged when I left his arms than when I first entered them.) I’ve taken lessons over the years but it isn’t second-nature to me, so I was excited when Jenn and I had the instructor all to ourselves! 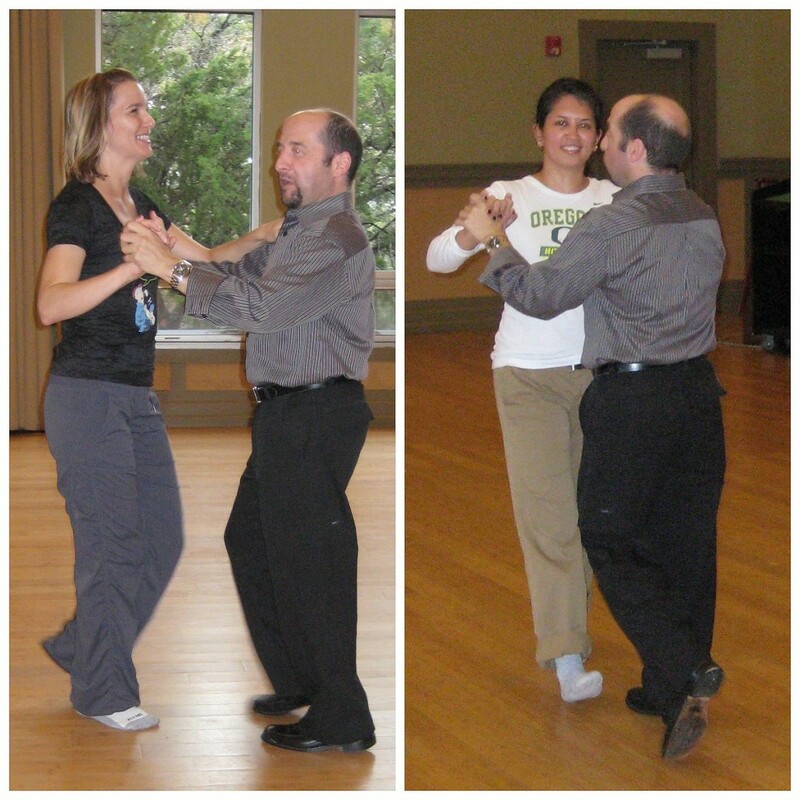 Dominic DiGesulado is the owner of an Arthur Murray Dance Studio and partners with Travaasa Austin to provide the two-step lessons. I can’t say enough positive things about his lesson! He was patient and very proficient, but most importantly he was really good at explaining dance concepts in a way you could apply them immediately. He was also very good at tailoring the instruction to the student – Jenn is from Houston and knows her way around the dance floor, so they worked on more advanced techniques. We could have spent three more days doing all the activities and enjoying all the fantastic spa services, but before we knew it the day was over and it was time to go back to the real world. We had an amazing time and I’d recommend it to anyone looking to surprise a loved one with a unique and special gift this holiday season! This entry was posted in Vitality and tagged Arthur Murray, Janis Joplin, mechanical bull, resort, spa, The Rose, Travaasa, Travaasa Austin, two stepping on December 13, 2011 by Wendy.